Dogs and toddlers can be overly excited when interacting with each other. This can result in pulled hair or tumbling children. They can also be shy or afraid in uncertain interactions. A misunderstanding can be dangerous. Both children and dogs need to be taught about appropriate behavior and both need a sanctuary place where they can retreat to be undisturbed. Here are some tips to promote safe and happy interactions. Your dog and your child both need a safe space where they can retreat when they’ve had enough. Your toddler should have a place to play energetically and your dog needs the choice to be there or not. A kennel is ideal, but a dog bed works, too. Teach your children that the kennel is off-limits and not to interact with the dog when she is in there. Enforce the idea that the bed or kennel is the dog’s private space. A dog needs a comfortable, safe place where the children never go. Encourage predictable and positive interactions to foster good relationships. Involve your child in the things your dog likes – feeding, treats, walks and play. When these things are positive experiences for your child and your dog, they will each grow more comfortable with one another. Always supervise interactions between your toddler and your dog. No one thinks their dog would bite their child. Yet it happens. 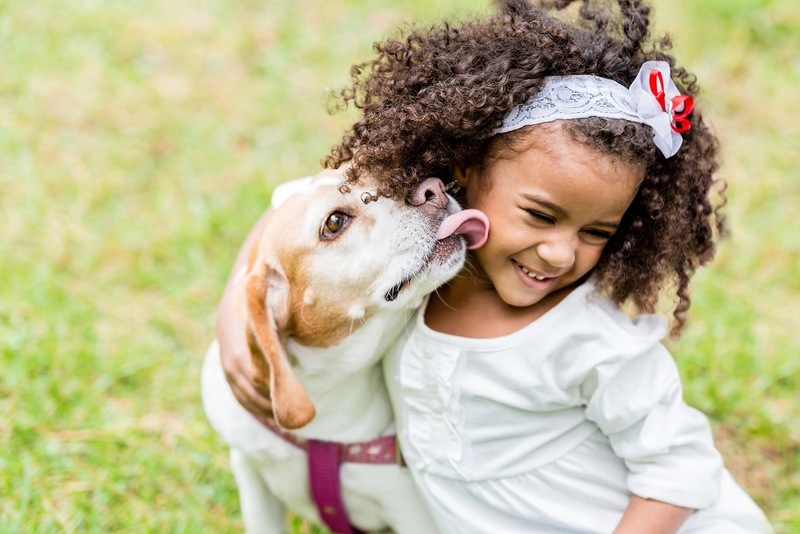 Each year in the US, about 400,000 kids receive medical attention for dog bites. Young children are at greatest risk and are frequently bitten by familiar dogs. Stories of what can quickly go wrong during unsupervised interactions are harrowing. “I have examples of 2-year-olds getting bitten in the face, and no one in the family saw it,” says Dr. Berger of the San Francisco SPCA. “I think that oftentimes parents have a false expectation of what should be tolerated from the dog’s end because we all have a story of a dog that does tolerate that. 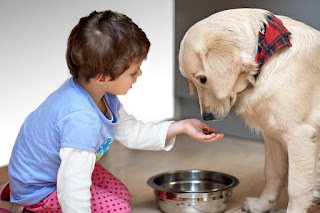 But oftentimes that can later lead to problems when the dog either gets older or if the dog has just had enough, and [the child’s behavior] pushes the dog over the threshold.” Books like Tails Are Not For Pulling, written by Elizabeth Verdick and illustrated by Marieka Heinlen, can help teach your toddler how to interact gently with the family dog. Learn to identify body language that indicates stress. Usually there are subtle signs of distress before a growl, which is a serious sign of fear, anxiety or stress. These early signs can include looking away (averting just the eyes or turning the head or body away), yawning and tense/rigid body postures. If you can recognize these indicators, you can intervene before there is any serious trouble. Looking away is usually the first sign of concern. From the dog’s perspective, a growl is a scream for help. Always ask permission to approach or pet unfamiliar dogs. Not all dogs are comfortable around kids, so they may not react well to being approached or touched. It’s also good to ask the dog to do something, like “sit” or “shake”, rather than simply reaching out to pet the dog, as this can provide a more predictable interaction for the dog. May I Pet Your Dog?, written by Stephanie Calmenson and illustrated by Jan Ormerod, can help teach your toddler the cardinal-rule of interacting with unfamiliar dogs: ask permission first.